Kolomenskoye is a former royal estate situated several miles to the south-east of Moscow downtown, on the ancient road leading to the town of Kolomna. 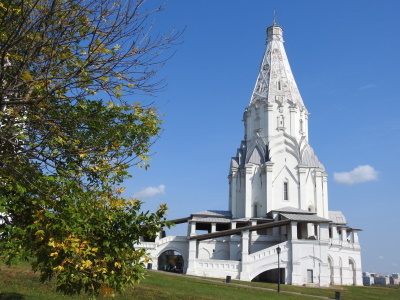 The earliest extant structure in town is the exceptional Ascension church (1532), built in white stone to commemorate the long-awaited birth of an heir to the throne, the future Ivan the Terrible. Being the first stone church of tent-like variety, the uncanonical "White Column" (as it is sometimes referred to) marked a stunning rupture with the Byzantine tradition. The church stands up toward the sky from a low cross-shaped podklet (ground floor), then follows a prolonged chetverik (octagonal body) of the church, and then an octagonal tent, crowned by a tiny dome. The narrow pilasters on the sides of the chetverik, the arrow-shaped window frames, the three tiers of the kokoshniks and the quiet rhythm of stair arcades and open galleries underline the dynamic tendency of this masterpiece of the Russian architecture. Located a few kilometers away from Moscow, Kolomenskoye was a small village until in 1532 the Russian Grand Prince decided to build a church as a token of his gratitude for the birth of a son, an heir to the throne, who would eventually come to be called Ivan the Terrible. (In my humble opinion, that is an absolutely awful name to give to a child. It’s like Denice the Menace but much worse. You could not expect him to get up to anything good with that moniker.) Church of the Ascension was the first tent-roof stone building in Russia and would become the turning point in Russian religious architecture. As you enter the church, you realize that the 3-meter thick walls encroach on the interior, making the church feel very small inside. This perceived narrowness of space does a lot to emphasize the height of the structure. After the construction of the church was completed, the status of the surrounding area grew in importance. 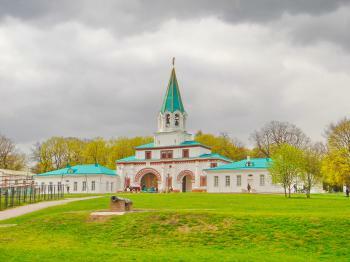 Kolomenskoye became a residence of the Russian tsars in the 17th century. It is here that Peter the Great staged his play battles during his youth. To celebrate his connection to this area, a small wooden house which he resided in during the Northern War in 1702 has been moved to Kolomenskoye. The entrance into each building of the complex is a nominal 100 rubles, but considering that there is not much inside the small church, you would do much better to enjoy its gleaming tower-like beauty from the outside. I visited this WHS in August 2016. The park and church are easily accessible by metro. There is a 20 minute walk from the Kolomenskaya station to the church. The first time I visited was on a Monday and the Church of the Ascension was closed. Moreover, it was raining cats and dogs and I couldn't really appreciate the white structures in such a cloudy sky. Therefore, on the following day I made up for it by revisiting and the weather was great just after a stormy day. The interior wasn't extraordinary and I could have easily grasped the site's OUV by gazing at its exterior. All listed buildings have information boards next to them and in front of the Church of the Ascension lies the UNESCO inscription plaque. 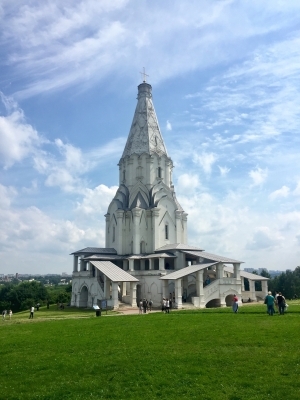 The whole park is worth exploring if you have the time and I enjoyed visiting the nearby Church of our Lady of Kazan with its starry blue domes, a smaller version of the domes of the Assumption Cathedral in Trinity Sergius Lavra in Sergiev Posad. All in all I really enjoyed my visit and I'd rank this WHS as the second best WHS in Moscow after the Kremlin. Located in the former riverside royal estate park in the suburb area of Moscow, the complex of Kolomenskoye Church is a lovely place to visit for afternoon walking. After a very long subway ride, the Kolomenskoye Park was very near to the subway entrance with clear sign for direction or just followed the tree. The first monument I saw was the big gate with lovely half cut onion dome-like wooden roof, the gate has two doors, the bigger one for royalties and the smaller one for commoners. After the gate I saw the lovely blue onion domes church, at first I misunderstood that this church was the Kolomenskoye Church until I discovered more area in the park. 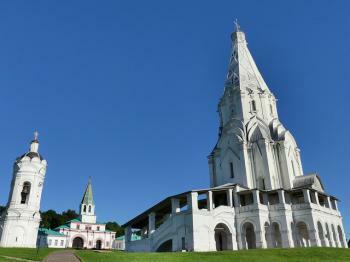 Just a short walk inside the forest park from the blue domes church, I encountered the very large white gate with green copper spire roof. The gate was really nice like the gate of Disney amusement park, but behind the gate was a very big white church not the princess castle, and again two different size of doors. The big white church I saw was the famous Kolomenskoye Church, the building itself was considered the Russian architecture masterpiece and the first brick church in this country. For me this place was just another big lovely Russian styled church, a white version of the famous Saint Basil Cathedral without smaller chapel of fancy onion domes, but I understood its importance and significance for architectural development. Unfortunately that the interior was closed during my visit, and personally I quite preferred the nearby cute bell tower more than the church. While I was walking around, there was a monk playing the semantron, this was my first time I heard the semantron and it was lovely to hear this musical instrument sound. In my opinion, Kolomenskoye is not the must see for short visitor, the Novodevichy Convent is a better recommendation and many churches in Kremlin Wall will already show you the Russian masterpieces, but if you want to visit, I guarantee you will have a nice time in this lovely park. Architecturally, the Ascension Cathedral is quite different from most other famous ones in Moscow or Novodevichy, this one being pure white sans onion domes. Although It is in the suburbs, it is easily accessible by metro (17 rubles) like 4 stops from the central ring. But as the structure was under repairs and closed for visit, the trip was at best an afternoon's walk through the park. If really pressed for time in Moscow, outside the Kemlin, I would go to Novodevichy instead. I visited the Church of the Ascension in the summer of 1995. It was amazing to stand in the shadow of such a beautiful, old building. Not only is the Church itself wonderful to view, but there is a wonderful view of Moscow across the river. I am from the central part of the USA. I count time in Russia as some of the best times of my life. During a Mission trip, the last few hours of the time in Moscow was spent here. Maintenance was superb and the descriptive signage most helpful. The buildings were closed but walking around the grounds was a special time. Views over the river were clear and offered a glimpse into potential lifestyle. Watching as a horse mounted patrol passed along the lower path was most colorful and to see the style dress worn by the young people a surprise that should not have been a surprise. Walking around the Church questioning it's style etched some of the details into memory. Now, reading of the "TENT ROOF" connection help to tie those details together. Coming from the Pacific Northwest, of particular interest were the 'wooden buildings'. WHAT AN AGE! ALthough seven years have passed, this remains a vivid experience. Now preparing some notes to go with an edited video of PETERHOF, it is interesting to see the tie-back as the place of PETER THE GREAT's childhood. THANK YOU. It would be interesting to read some other comments.